Meckel-Gruber syndrome is a rare autosomal recessive lethal malformation characterized by typical manifestations of occipital encephalocele, bilateral polycystic kidneys and post axial polydactyly. The worldwide incidence varies from 1 in 13,250 to 1 in 140,000 live births. Highest incidence was reported in Gujarati Indians. We report a rare case of Meckel-Gruber syndrome and review of literature. Meckel-Gruber syndrome (MGS) is a triad of occipital encephalocele, large polycystic kidneys, and postaxial polydactyly. It is a rare, lethal autosomal recessive condition mapped to 6 different loci in different chromosomes. Meckel-Gruber syndrome is a condition characterized by ciliopathies caused by dysfunction of cilia and flagella. Polycystic liver and kidney disease, Bardet-Biedl syndrome, Alstrom syndrome, and Joubert syndrome also belong to the same group. 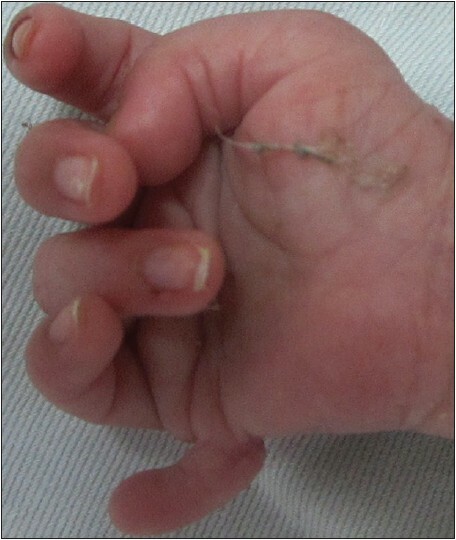 We report a female baby with a typical triad of Meckel-Gruber syndrome. A full term baby born of a non-consanguineous marriage, in non-Gujarati (Sindhi) community was brought with a swelling over occipital region. 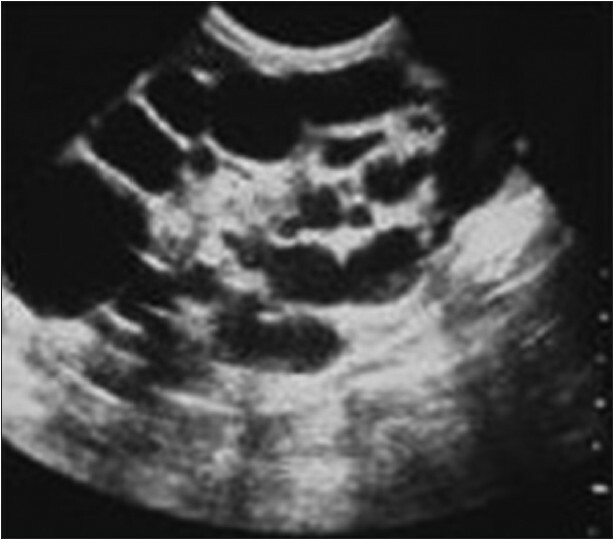 Antenatal Ultrasonography (USG) was suggestive of occipital encephalocele, polyhydramnios and dysplastic kidneys. On examination there was a fleshy mass of size 5 × 5 cm with exposed meninges with flat anterior fontanel [Figure 1]. Left hand and foot each had an extra digit on medial side [Figure 2]. Fundus examination was normal. Spine examination was normal. USG Brain showed normal brain parenchyma, mildly dilated third ventricle and bone defect in posterior part of calvarium with herniation of brain tissue. USG abdomen was suggestive of bilateral multicystic dysplastic kidneys [Figure 3]. 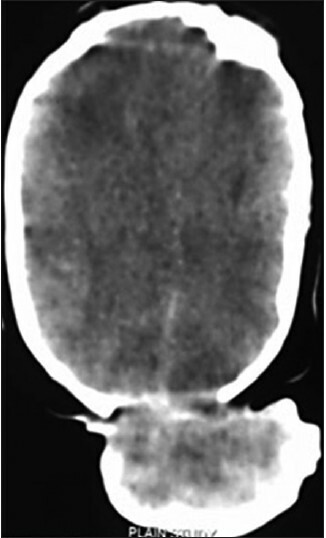 Computerized tomography (CT) brain was suggestive of large occipital encephalocele with normal ventricles [Figure 4]. Excision with duraplasty was done in prone position. Patient needed mechanical ventilation postoperatively, and the baby expired due to ventilator associated pneumonia. The highest incidence of 1 per 1,300 live births (carrier rate of 1 in 18) was reported in Gujarati Indians by Young et al. in Perinatal mortality survey for the years 1976 to 1982. There is evidence which indicates that the gene frequency of Meckel's syndrome is particularly high in the Leicestershire Asian Hindu community originating from the Gujarat State in Western India. The incidence is also high among Belgians and Bedouins in Kuwait (1 in 3,500 with a carrier rate of 1 in 30), Finnish population (1 in 9000 with a carrier rate of 1 in 50). Meckel-Gruber syndrome affects with equal incidence in males and females. Meckel-Gruber syndrome inherits in families as autosomal recessive disease with a 25% chance of recurrence in each pregnancy. Although Meckel-Gruber syndrome has been reported commonly in consanguineous marriages, it is also known to occur in children from non-consanguineous marriages  suggesting that the single gene defect occurs more commonly in the latter population than mutant genes associated with other autosomal recessive disorders that are usually related with consanguineous marriages. It is mapped to 6 different loci in different chromosomes 17q21-24 (MGS1), 11q13 (MGS2), 8q21.3-q22.1 (MGS3), 12q21.31-q21.33 (MGS4), 16q12.2 (MGS5), and 4p15.3 (MGS6). This mapping suggests genetic heterogeneity in Meckel-Gruber syndrome. In an autopsy review of 9 cases, Blankenberg concluded that following hepatic lesions are consistent features like arrested development of the intrahepatic biliary system, reactive bile duct proliferation, bile duct dilatation, portal fibrosis and vascular obliteration. Meticulous autopsy in the suspected cases is necessary to establish the diagnosis of various possible anomalies associated with this syndrome. Meckel-Gruber syndrome is a lethal disorder. Most infants are stillborn or die within few hours or days after birth. A few sometimes survive for few months with poor quality of life. The high mortality and morbidity is due to non functional kidneys, liver and pulmonary hypoplasia. The parents can be counseled about the outcome and prognosis of the fetus and recurrence risk for the next pregnancy. Fetal autopsy is advised to establish the correct diagnosis. Meckel-Gruber syndrome is a lethal and rare autosomal recessive condition characterized by occipital encephalocele, polycystic kidneys and post axial polydactyly. Counseling forms an integral part of management especially about the recurrence risk of subsequent pregnancies. Our aim of this review is to enhance the knowledge and spread awareness about this rare and lethal anomaly. 1. Smith UM, Consugar M, Tee LJ, McKee BM, Maina EN, Whelan S, et al. The transmembrane protein meckelin (MKS3) is mutated in Meckel-Gruber syndrome and the wpk rat. Nat Genet 2006;38:191-6. 2. Young ID, Rickett AB, Clarke M. High incidence of Meckel's syndrome in Gujarati Indians. J Med Genet 1985;22:301-4. 3. Ramadani HM, Nasrat HA. Prenatal diagnosis of recurrent Meckel syndrome. Int J Gynaecol Obstet 1992;39:327-32. 4. Johann FM. (The younger) Editorial. (1781-1833). JAMA 1970;214:138-9. 5. Gruber BG. Beiträge zur frage "gekoppelter" missbildungen. (Acrocephalo-Syndactylieund Dysencephalia spanchnocystica). Beitr Path Anat 1934;93:459-76. 6. de Silva MV, Senanayake H, Siriwardana KD. Meckel Gruber Syndrome: Occurrence in non-consanguineous marriages. Ceylon Med J 2004;49:30-1. 7. Vince JD, Baki M, Chakravarti P. Meckel-Gruber syndrome: Report of an affected Papua New Guinean family. P N G Med J 1998;41:83-4. 8. Ramachandran U, Malla T, Joshi KS. Meckel-Gruber syndrome. Kathmandu Univ Med J 2006;4:334-6. 9. Walsh M, Graupman P. Meckel-Gruber Syndrome in association with an occipital meningocele. Pediatr Neurosurg 2006;42:333-4. 10. Abdelmoneim EM, Abdelmutalab I, Ilham MO. Meckel-Gruber syndrome: A rare and lethal anomaly. 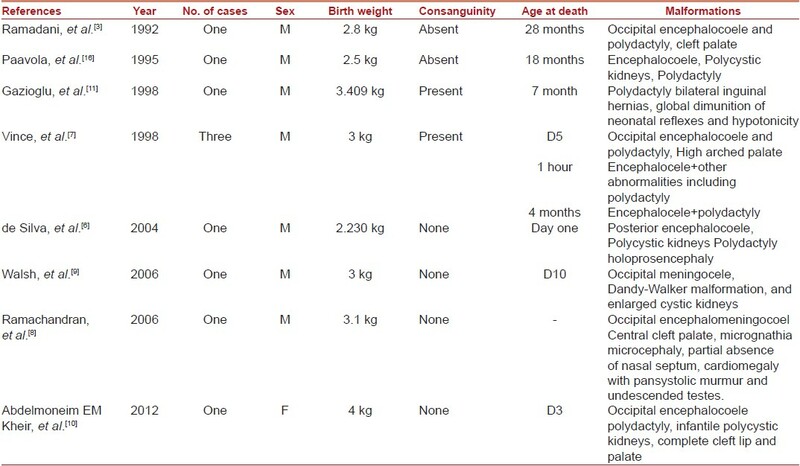 Sudanese Paediatr 2012;12:93-96. 11. Gazioðlu N, Vural M, Seçkin MS, Tüysüz B, Akpir E, Kuday C, et al . Meckel-Gruber syndrome. Child's Nerv Syst 1998;14:142-5. 12. Salonen R, Norio R. The Meckel syndrome in Finland: Epidemiologic and genetic aspects. Am J Med Genet 1984;18:691-8. 13. Blankenberg TA, Ruebner BH, Ellis WG, Bernstein J, Dimmick JE. Pathology of renal and hepatic anomalies in Meckel syndrome. Am J Med Genet Suppl 1987;3:395-410. 14. Opitz JM, Howe JJ. The Meckel syndrome (dysencephalia spanchnocystica, the Grüber syndrome). Birth Defects 1969;2:167-79. 15. Su SL, Liu CM, Lee JN. Prenatal diagnosis of Meckel-Gruber syndrome case reports. Gaoxiong Yi Xue Ke Xue Za Zhi 1995;11:127-32. 16. Paavola P, Salonen R, Weissenbach J, Peltonen L. The locus for Meckel syndrome with multiple congenital anomalies maps to chromosome 17q21-q24. Nat Genet 1995;11:213-5. 17. Meckel JF. Beschreibung Z. Durch sehr ähnliche bildungsabweichungen entstelter geschwister. Dtsch Arch Physiol 1822;7:99-172. 18. Sepulveda W, Sebire NJ, Souka A, Snijders RJ, Nicolaides KH. Diagnosis of Meckel Gruber syndrome at eleven to fourteen weeks' gestation. Am J Obstet Gynecol 1997;176:316-9.